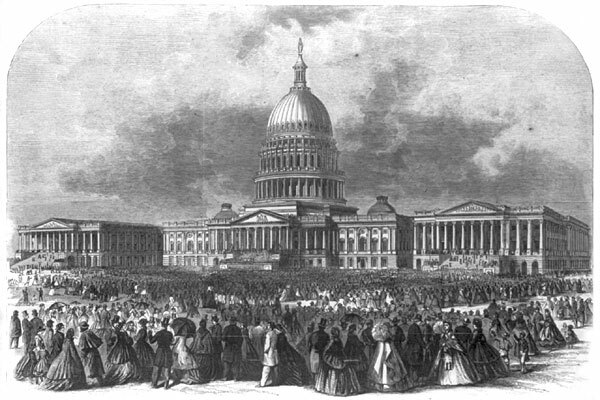 The President very quietly rode down to the Capitol in his own carriage by himself, on a sharp trot, about noon, either because he wished to be on hand to sign bills, or to get rid of marching in line with the absurd procession – the muslin temple of liberty and pasteboard monitor. Helen Nicolay, Lincoln’s Secretary, pp. 224-225. Lawrence A. Gobright, Recollection of Men and Things at Washington During the Third of a Century, pp. 341-343. 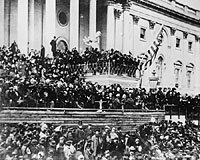 Michael Burlingame, editor, Lincoln Observed: Civil War Dispatches of Noah Brooks, p. 166. Thomas Reed Turner, Beware the People Weeping, p. 71. Burlingame, editor, Lincoln Observed: Civil War Dispatches of Noah Brooks, pp. 167-169. Phillip S. Paludan, Lincoln’s Legacy: Ethics and Politics, p. 11. Walter Lowenfels, editor, Walt Whitman’s Civil War, edited by, pp. 258-259. 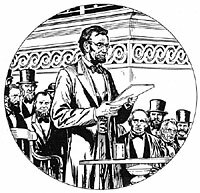 Smith Stimmel, Personal Reminiscences of Abraham Lincoln, pp. 71-72. 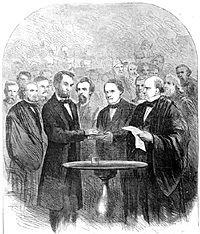 Noah Brooks, Washington, D.C. in Lincoln’s Time: A Memoir of the Civil War Era by the Nedwspaperman Who Knew Lincoln Best, p. 214. Allan Nevins, The War for the Union, Volume IV, p. 27. Jay Winik, April 1865, p. 39. Michael Burlingame, editor, William O. Stoddard, Inside the White House in War Times, p. 79.